In commemoration of the 30th Anniversary of Final Fantasy, take home this cute Chocobo plush. Chocobo is dressed up as the Warrior of Light with a commemorative 30th Anniversary shield. Chocobo's Warrior of Light helmet is removable. 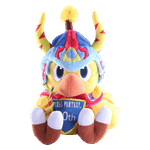 Celebrate this momentous occasion with this adorable Chocobo plush! The Chocobo plush is made of a 100% polyester fabric shell with cotton stuffing and comes packaged in a protective plastic bag. Measures approximately 8 1/3-inches tall x 7-inches long x 5 1/3-inches wide.